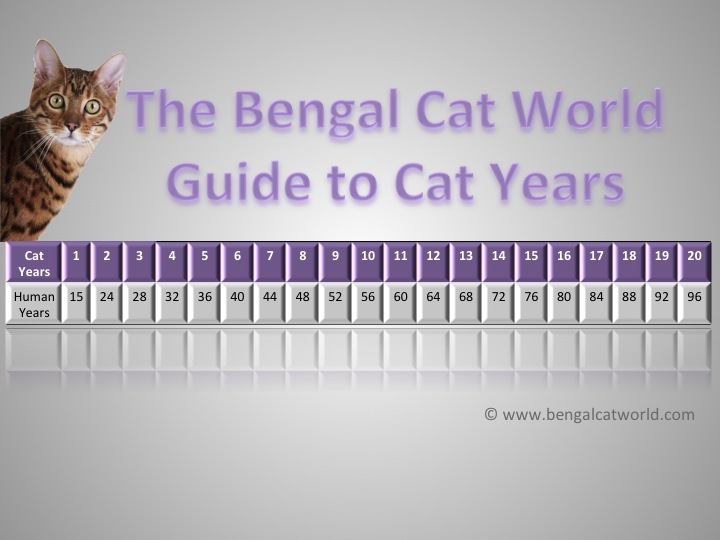 If you’ve ever wondered how old your cat is in human years, our handy guide should help you! You’ll see that in the first two years of a cat’s life, their human age goes up rapidly. This is very logical if you think about it, most cats are fully mature by the time they are 1 or 2 years old, therefore equivalent to an adult human being. After this, the age goes up in a pattern: 1 cat year = 4 human years! Simples! Spot the Bengal may be a young one, but Kinja, my Marble coated Bengal has just turned 20 this month in early November 2016 which makes her the equivalent of 96 human years and all of a sudden, I see some lethargy and change in her hunger and behavior that makes me wonder if she’s on her way out. I will be making an appointment with her vet and hope she lasts to see him. Awwww <3 20 is a good age, we hope she is ok.